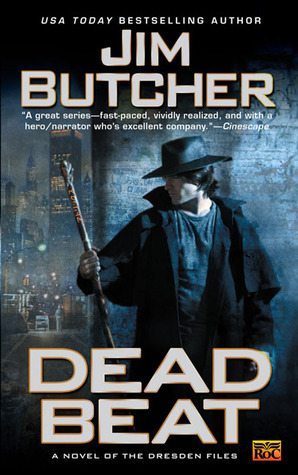 "Jim Butcher's Dresden Files novels have been compared to Harry Potter with an adult tone and attitude. Now, in his first hardcover adventure, Harry Dresden must save Chicago from black magic and necromancy-all in a day's work for the city's only professional wizard." First off I have to say that this book is a great addition to this series! In this book a whole bunch of things that was, to me, left unsaid or incomplete was brought into light such as, the fallen angel whom Harry acquired when he picked up a coin so little Harry; Michael a friend of Harry's and a Knight of the Cross's son-- so that he would not pick it up. After locking the coin away and having very little mention of it, in this novel Harry finally gets to 'meet' her, in his head. Also, Murphy and Kincaid. Murphy and Harry. Definitely some stuff going on here that we get here. Along that line of thought Gentleman Johnny Marcone is also in this novel being his usual self, bad and mysterious. So great as always! Oooh, Mavra, I knew she had something else up her sleeve, errr, so to speak! She is back in this novel and I have to admit that in the end I was a little confused, on her line of plot. And what is she wanted with the book to begin with, I hope it is something that will be cleared up in the future. I would recommend this novel to anyone who is looking for a great paranormal/urban fantasy read but as before I would recommend that you read the first six books in the series first.